My first single is actually an end of a long lasting process. And maybe a beginning of another. I played these riff:s and chords by myself thirty years ago. At that time my musical career was revolving in a band called The Brainles. We disbanded, when our careers led us to different directions. At 2009 we assembled again shortly almost with our original players to make a recording called: The Brainles Revisited. It was never on sale and it was only distributed among family and friends. At a later stage, I did make a couple of videos out of them on YouTube at sokelo channel. 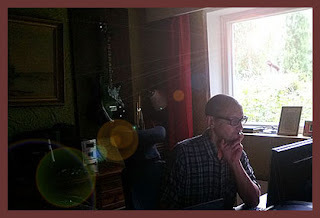 During the past couple of years I have visited Perägrammari Studio in Kinnula with a friend of mine (former Brainles guitarist) and his sons to record cover versions of music we still like. Perhaps the best is our version of Sultans Of Swing, which was also in our playlist during the Brainles days. This version is also available in YouTube channel sokelo. I also made a cd with cover versions for our own usage and for YouTube at summer of 2012. The name of the cd was simply Esa Sorola. Again, not for sale, just for fun. However the agony had lasted for thirty years, so I decided to record those riffs and chords on this CD single. Perhaps to get myself a peace of mind, or maybe I want to make other people restless? I do not know why, but I just had to do this. I have now a finnish and an english version for both of these songs, but at the time of making, only the ones on the record were ready. Maybe some day, me or someone else, will publish the other versions too. And if someone else wants to perform these peaces of music, I would be grateful and honored.